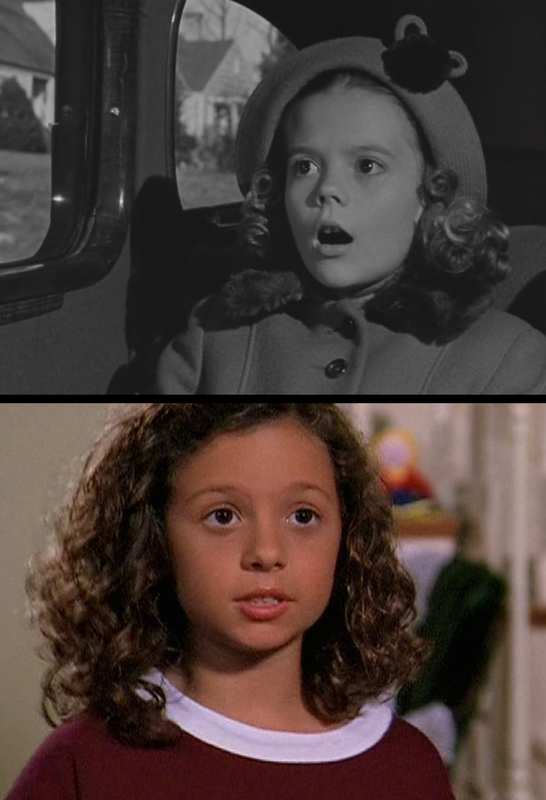 Is it just me, or does young Natalie Wood look a lot like Mackenzie Rosman, the girl who played Ruthie in that awful TV series 7th Heaven? Tedious Christmas fantasy in which the real Santa Claus becomes the store Santa at Macy’s, fixes a woman and her daughter who lack imagination, and is put on trial for being crazy. Edmund Gwenn is great as Santa, conveying just the right amount of warmth and wisdom. There are also a few nice ideas and scenes. However, mostly it’s quite disappointing and predictable. It’s hard to care much about Mrs Walker and Susan’s plight, let alone the barely-explored relationship between Mrs Walker and Mr Gailey. Also, Mrs Walker’s sudden change from hard-headed pragmatist to open-minded fantasist is not explained well and is therefore unconvincing. I was amused by Santa’s line “That’s what I’ve been fighting against for years: the way they commercialise Christmas”, given that the movie is effectively one big ad for Macy’s. And turning even further to trivialities, I learned two things by pausing when fake newspapers were shown on-screen and then using my friend Google: firstly, that the bizarre headline ‘Earth Forces Laid to Cosmic Impulse’ was a real headline used in The New York Times in 1933 and subsequently shown in this movie as well as Reefer Madness (1936) and Decoy (1946); and secondly, that the word ‘alienist’ is an archaic term for a psychiatrist or psychologist. Now you know too! This entry was posted in 1947, 5, Reviews and tagged 7th Heaven, Christmas Movies, Decoy, Edmund Gwenn, Film, George Seaton, John Payne, Mackenzie Rosman, Maureen O'Hara, Miracle on 34th Street, Movie Reviews, Movies, Natalie Wood, Reefer Madness, Santa Claus on April 28, 2014 by moviesandbacon.